I recently conducted a workshop titled “The Hatchback Production Kit” at the Camera Company Pro Video Show in Dedham, Massachusetts. During the workshop I promised to post an inventory of the items I discussed in the workshop. I described the kit I’ve assembled for shooting formal interviews. I prefer shooting hand-held and travelling with a single camera bag, however, sometimes I need more gear to achieve specific results. This kit, suitable for both documentary and bare bones narrative, is designed to fit in the hatchback of a compact car and is also designed for air travel. In a pinch I can lug it all by myself, though I usually work with a collaborator. Rather than purchase a specific kit, I think the best approach is to put together a custom kit that meets your own unique needs based on your own shooting style and production value priorities. This kit is an attempt to balance capability, cost, weight, and size and I am always adding and subtracting items from it as my shooting needs change. The kit is divided into four separate components: 1. Camera bag, 2. Tripod bag, 3. Sound case, and 4. Lighting case. 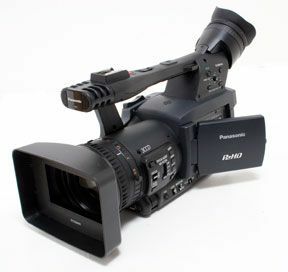 I currently shoot with a Panasonic AG-HPX170 camcorder (3-1/3″ CCD chip). I prefer a camcorder for hand-held shooting, however, I sometimes will borrow a D-SLR when I want the “35mm look” in terms of shallow focus. I love the ergonomics of the HPX170, the Panasonic look, the excellent microphone pre-amps, and the fact that it records four channels of audio. When using XLR inputs 1 and 2, the sound from the on-camera stereo mic is routed to channels 3 and 4, providing stereo ambience that often helps to fill out “dry” lavaliere audio. This camera captures video in the DVCPRO HD format and records to P2 cards. I like the reliability of the P2 cards and the low amount of image compression of the DVCPRO HD format compared to AVCHD. Although the HPX170 is only a 720p camera, I often inter-cut HPX170 footage with other footage shot with 1080p cameras with excellent results. Sharpness is more than a single technical factor, lighting, exposure, and the subject/background relationship also contribute to our sense of image sharpness. If I was to purchase a camera today, I would most likely buy the Panasonic AG-HPX250 camcorder. It improves upon the HPX170 with a true 1080p imager and several other features, but essentially it is pretty much the same camera. I use an old Steadicam JR camera bag to carry the camera because it’s just the right size for the camera and accessories. Finding just the right camera bag is tough, because a lot of cases don’t fit “under the seat in front of you” and for air travel this is a key requirement. A good case currently on the market you might consider is the Portabrace CS-DV4R/PAN camera case specifically designed for the Panasonic HPX170/HPX250 cameras, but it’s larger than what I like using, though it does provide better protection for your camera than the hand-me-down case I currently use. Three Panasonic CGA-D54 Li-Ion batteries (I recommend sticking with the genuine Panasonic batteries, knock-offs are not as high in capacity and do not last as long). Gaffer tape on small a spool (handy stuff with hundreds of uses, don’t ever substitute duct tape for gaffer tape, gaffer tape, when applied and removed properly, does not leave disgusting residue like duct tape). Sunpak Pro 724M carbon fiber monopod (I attach the monopod to the outside of my camera bag with velcro ties. I like shooting hand-held using the monopod to lower the center-of-gravity of the camera, making it easier to keep the camera stable, effectively using the combination of my arm, hand, and tripod as a makeshift Steadicam). Depending on where and how I’m shooting, I will move the chargers and extra batteries into the sound case and keep whatever sound gear I’m currently using with me in the camera bag. When it’s time to pack up and go home then everything goes back to it’s original position. For this reason it’s important to find a camera bag that’s large enough to add the extras you need while shooting (wireless microphone and/or shotgun, extra battery, headphones, etc.). Manfrotto 503HDV head with Manfrotto 351MVB2K legs combination (The 503HDV head provides smooth, fluid movement and the legs are very stable. These models are no longer made, however, the closest equivalent in their product line is the Manfrotto 504HD head and the Manfrotto 546B legs. 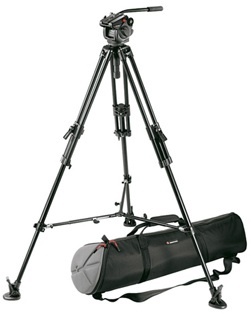 These tripods are heavy enough to be stable, while light enough to carry on your shoulder. Davis & Sanford Steady Stick Compact (I prefer this lightweight and small camera support system over more complex, heavier, and expensive stabilizer systems. A belt-mounted support arm supports most of the camera weight and leaves your hands free to control camera movement. This does not replace a standard Steadicam by any means, however, with practice it can be a much smoother alternative to hand-held. The build quality and design leaves a little to be desired, but given the price, especially when purchased at a discount, it’s a good value. Padded bag (I travel with the Manfrotto bag that came with my 503HDV and 351MVB2K combo, this nylon bag, although rugged, is not designed to be checked as baggage, however, by loosening the pan and tilt controls as well as the 75mm ball joint, and removing the pan handle, I’ve managed to check the head and legs as baggage many times without damage. 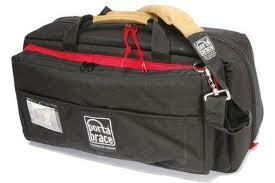 If you leave these tight, however, you are asking for trouble when the case takes a hard tumble). 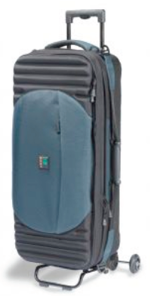 HPRC 2550W hard rolling case (I’ve checked this as baggage many times without any equipment damage, it’s the same size as a carry-on with smooth rolling wheels and a retractable handle. Pelican also makes great hard cases, I own four of them, but in this form-factor I liked the design of the HPRC case better). 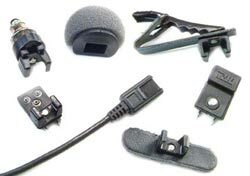 Rycote Softie mount (for placing shotgun on the camera, unlike the build-in mic holder, allows me to point mic to left or right directly at the subject to keep speaker right on axis with the microphone. Unless you always center your subject, the built-in mic holder will always hold the shotgun in the wrong place. Though on-camera is not the best place for the mic, in a pinch when shooting vérité I mount my shotgun on the camera. This mount can also be placed on a boom pole. Audio-Technica BP4029 MS stereo shotgun microphone (I use this microphone three different ways: 1. as an on-camera documentary microphone, using the M and S channels to capture what’s to the side (S) and in front of the camera (M) separately; 2. as a stereo microphone for recording stereo ambient sound; and 3. as a standard mono shotgun microphone by using only the mid-channel (M) with a stereo-to mono adapter cable. In a future post that’s part of my on-going sound series, I’ll be writing more about this microphone and the ways I use it. 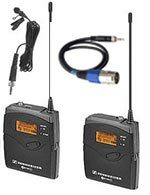 Three Sennheiser Evolution 100 G3 wireless lavaliere microphone kits (these wireless systems are a really good value and I wrote about them in a blog post a while ago). Rycote 10cm Hot Shoe Extension Bar (this allows you to attach two Sennheiser Evolution 100 G3 wireless receivers to the single hot shoe on the camcorder. Sennheiser Evolution 100 G3 plug-on transmitter (for use with the RE50 hand-held microphone, whatever mic this is used with must have a metal body since it is used as the antenna). Roland R-09HR digital audio recorder (The R-09HR is no longer sold but the newer Roland R-05 is an improvement and recommended if you want a small, compact stereo recorder. I keep my recorder in my backpack or in the sound kit along with some ear buds and a pair of Giant Squid Audio Lab omni-directional electret condenser microphones which are powered using the plug-in power provided by the Roland. This is the set up I use for casual audio-only interviews. I also use the Roland for capturing ambient sound on location. If I want to use the Roland with XLR microphones, I’ll run the microphones into the Sound Devices 302 mixer and then run the line out of the mixer into the line in of the Roland. Two Lowel Tota-Lights with umbrella (often used as a background light, for overall fill, or as a fill light if needed). If I had to do it all over again, I’d get the Lowel V-Lights instead of the Totas, but I purchased the Totas long before the V-Light existed. I’m also thinking of adding one or two 150 W Arri Fresnels to the kit as accent lights along with replacing the cords on all the Arri’s with smaller cords that will fit better in the case. Three or four Avenger A625B light stands (these extend to 7.8′ but are a compact 26″ when closed (depending on the number of Totas in tow). 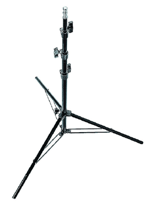 The Avenger A625B Light Stands are no longer available, a reasonable replacement with a new stacking feature would be the Manfrotto 1051BAC Light Stand, Black – 6.75′ extended and 26″ when closed, not quite as tall as the older stands but for a portable kit, the stacking feature means they will nest more snugly in the case. Transparent micro-bubble finish powder and make-up pads (essential to reduce shine, especially with interviewees with an oily complexion. I purchased mine at Ricky’s NYC, but you can use any professional-quality transparent cornstarch-based finishing powder on all complexions to reduce shine, there are several brands on the market, look for something that claims to be completely clear). Half CTB gel sized with holes to fit the Rifa light (a full blue would reduce the light output too much, but using a half blue and setting white balance to that yields a nice look when mixing with exterior daylight that will appearing blue but not too blue when balancing the white balance to the Rifa with a half blue gel). This lighting kit has worked out well over the course of many interviews. 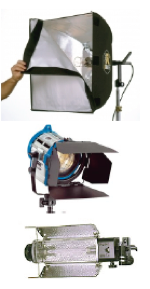 The Rifa LC-55 (500W) produces just enough light for most situations, and it’s the right choice for a lightweight and compact kit, however, if I could spare the space and weight, I’d rather be using a Kino Flo Diva-Lite or better yet the Zylight IS3. Over time I plan on replacing the quartz-halogen units with LED units as price/performance ratios improve, the Blender was a good first foray into LED lights, and a Zylight Z90, which I have used and really like a lot is on the horizon (due to its solid design and amazing color changing characteristics). Notes: Special thanks to the students who attended The Hatchback Production Kit workshop, they inspired this blog post. Some of the material is based on a previous post, A one-case lighting kit ready for travel. Thank you Kino-Eye for this practical, comprehensive, and very helpful information.